Kick - Melting Ice Out of Your Cooler, New and Innovative Cooler Accessory Launches on Kickstarter. Cooler Insert launches a crowd funding campaign on Kick starter hoping to raise $15,000 to help cover expenses for their first major production run. The Cooler Inserts unique and innovative design promises to be the solution to messy, melting ice in coolers everywhere. Cobleskill,NY ) August 16, 2017 -- No matter whether a person spends $40 or $400 on a cooler, the fact of the matter remains . . . ice MELTS! This same melting ice if left unchecked is sure to create a mess that will put the kibosh on any outdoor adventure. So begins the daily ritual that cooler users everywhere are all too familiar with: drain off melt water, check for wet food, add more ice. There has got to be a better way! That's exactly what three members from a family of avid campers in upstate New York thought too. Greg Donnell, co-creator of the Cooler Insert was the one who originally had the idea for separating the ice from the food rather than the time steeped tradition of separating the food from the ice. Shortly thereafter he teamed up with his sister, Kathy Krisowaty and her husband Ted. The three have worked tirelessly over the past few years to develop and produce the Cooler Insert, while at the same time applying for and being awarded two US utility patents with another still pending. The insert can be filled with ice cubes and water or filled with water and frozen like a rock. 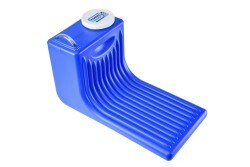 There's no need to worry though, the Cooler Insert is completely freeze/thaw stable and covered by a lifetime warranty. The Cooler Insert is much more than a frozen milk jug. As the ice inside the insert melts the air inside the cooler begins to gently circulate providing fridge-like temperatures throughout the cooler. No it's not magic, it's convection. Remember that lesson from sixth grade science class? Cold air settles and warm air rises. 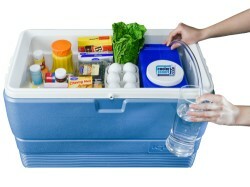 Because of its unique shape and design the Cooler Insert actually captures and harnesses this naturally occurring process turning a cooler into a portable fridge. "While the Cooler Insert may seem simple it's extremely effective at solving the problems we all deal with while using ice inside our coolers" says, Kathy Krisowaty. Without question the most jaw dropping feature of the Cooler Insert has got to be the siphon. When it's time to add more ice to the insert, there's no need to unpack the cooler or remove the insert. Simply pull the provided siphon tube over the edge of the cooler to easily drain off the melted ice water. Once the water is low enough, add a bag of ice to the insert for another 2 to 3 days of worry free cooling. It's that easy. The best part is, because the Cooler Insert is manufactured from all FDA approved materials the water is a completely usable by-product. The Cooler Insert is proudly made in the USA, in Iowa.